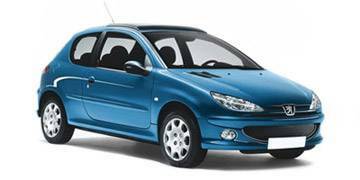 Read our helpful guide to second hand Peugeot 206. AA Cars works closely with thousands of UK used car dealers to bring you one of the largest selections of Peugeot 206 cars on the market. You can also browse Peugeot dealers to find a second hand car close to you today. All used Peugeot 206 on the AA Cars website come with free 12 months breakdown cover. The Peugeot supermini began production in 1998 and, upon its launch, emerged as one of the best selling cars of all time. Today, it's an incredibly cost-effective car to buy and run while continuing Peugeot's reputation as a safety-first car manufacturer. In EuroNCAP crash tests, the 206 model with dual frontal airbags, earned four out of five stars for safety. The 206 was originally launched as a hatchback with 1.1, 1.4, and 1.6 petrol engines and a 1.9L diesel, a HDi arriving a little later. Today, 206 petrol engines range from 1.0 L to 2.0 litre and diesels from 1.4 to 2.0. Lookout for other 206 models, the 206 CC coupe cabriolet with electric roof and 206 SW estate.